This Tuesday, 11 November 2014, for the fourth year in a row, hooligans clashed with police during a far right march organized in Warsaw to commemorate Polish independence. The first mass rally of this kind, uniting key nationalist groups, was held in 2010 and has now become the biggest far right event in the country. While for most part of this year’s parade the participants remained peaceful, on the last leg of the march, after crossing the Vistula River to the eastern bank near the National football stadium, a group of rioters broke away. They tore up the pavement, sending cobblestones flying at the riot police. Pieces of a bench from a nearby bus stop, flares and bicycles followed shortly after. In response, the police fired rounds of rubber bullets into the air, used water canons and pepper spray. Mariusz Sokolowki, Warsaw Police spokesperson, said that over 200 people had been detained, while 32 were injured, including 12 police officers. Many participants were arrested before the march for carrying items that could potentially be used as weapons. The damages caused by the violent incident are estimated to have reached $26,500. The leader of the National Movement - the far right group organizing the rally- Krzysztof Boask said the organization condemns “all hooligan activity“ that took place on 11 November. Asked about the political affiliation of those responsible for the confrontation with the police, he told Ruom it is “hard to know who were these people“. “Some of them were dragged into the fighting by the police forces as they blocked us at the end of the bridge,“ he added. 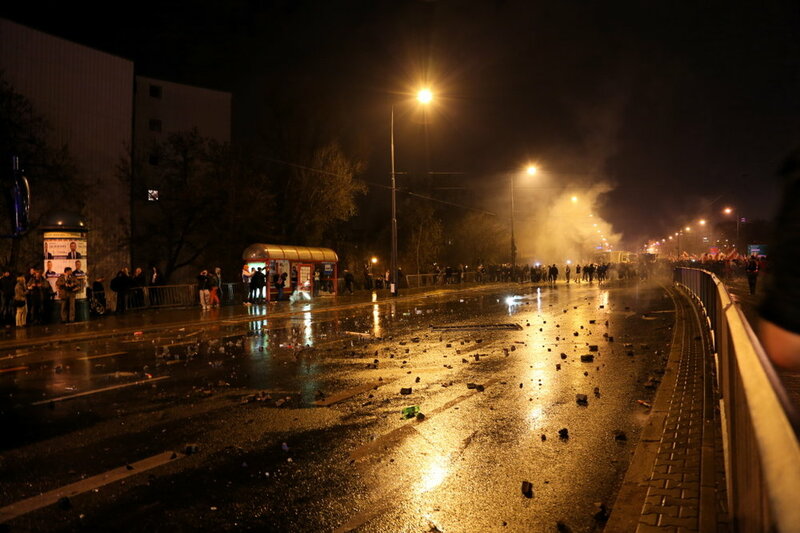 Participants of the rally, like Paulina Switalska of the National Radical Camp, one of the most prominent nationalist groups in the country, were equally reluctant to assign full blame to the rioters. Although as a woman she represents the minority in nationalist groups, she belongs to the age group – 18 to 25 - that is most heavily represented at the event. Together with her radical peers, both male and female, she belongs to what many refer to as “generation 2,000 zloty“ – a term used to describe young, educated Poles who struggle to make a living for themselves in a “European“ Poland and consequently are often disillusioned with the current system. And although the theme of the march -“the Army of Patriots“ – seemed to infer a military context, it was the European Union, not a potential armed conflict that was identified as the biggest threat faced by Poland during inauguration speeches that launched the march. United in their disdain for the European Union and immigration, nationalists from neighbouring Slovenia, France, Hungary, Finland, Italy and Spain also joined the mass rally. The increase of anti-EU sentiments comes at a crucial time for Poland – ten years after it entered the union. Many Poles feel the EU is threatening “traditional Polish values“, which are intrinsically linked to the Catholic Church and its teachings, including the condemnation of homosexuality and abortion. Over the years, 11 November became a symbol of divisions in the country ruled by a centre-right government, which has put Poland on an unprecedented and so far steady course of economic growth. With violent displays of anger becoming a regular feature of the far right Independence Day rally, it seems a new, dangerous tradition is in the making. This article is part of a larger project about women in far-right groups in Poland that Ruom’s Marta Kasztelan is working on together with Marta Soszynska.